After facing defeat in the opening match, West Indies are set to host England for another T20I at Warner Park, Basseterre on Friday. 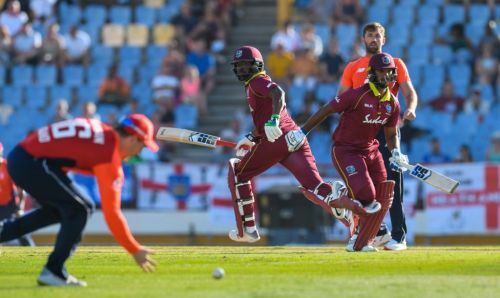 The Windies must be looking to bounce back after being battered in the first T20I at St Lucia whereas the visitors have the opportunity to seal the series in the upcoming match. Both these T20I giants will collide once again for another epic encounter in what has turned out to be a spectacular tour. West Indies have looked a different side since Jason Holder took charge last year. They look more confident and lethal as a unit, especially in their home conditions. The hosts outplayed England in the Test series and toiled hard in the ODI series. The T20I series began on a sour note for the two-time world champions as they lost the opening match by four wickets. Batting first on a tricky track, the WIndies managed to post a challenging total of 160 runs on the board. West Indies would be eyeing to land a counter punch in this must-win match to level the three-match series. Chris Gayle and Shimron Hetmyer need to lead the batting attack on a slow track in this crucial contest. On the contrary, England was flying high before arriving in the Caribbean for their last tour ahead of the ICC World Cup. Having lost the Test series by 2-1, the visitors tried to up the ante in the ODI series but failed to seal the series as it ended in a 2-2 draw. After a string of inconsistent performances, England must be determined to finish this forgettable tour on a winning note. Tom Curran took four wickets in the first innings while Jonny Bairstow led the clinical chase to take his team over the line. With a win in their kitty, Morgan and his team will be eyeing to seal the T20I series in the second match tomorrow.